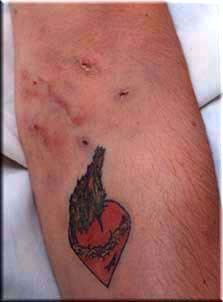 For detailed information about the drug Heroin, see the Heroin FAQ See also Heroin Pictures - Images of Heroin. There are many signs of heroin addiction to look for if you suspect someone you care about is using. 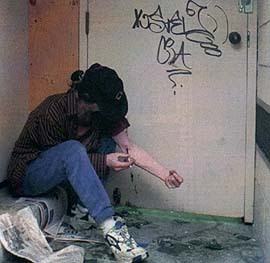 Heroin addiction affects the users brain. It enters their brain quickly and slows down the way they think, their reaction time, and their memory. This affects the way they act and make decisions. The signs of heroin addiction affect the users body as well. It poses special problems for those who inject it because of the risks of HIV, hepatitis B and C, and other diseases that can occur from sharing needles. These health problems can be passed on to sexual partners and newborns. Heroin, when pure, comes as a white powder but it usually contains other substances such as glucose, talcum powder or brick dust. 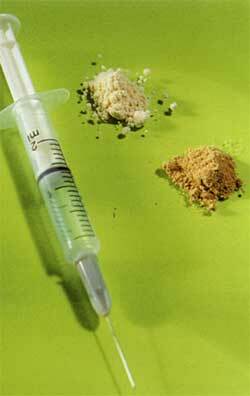 When heroin is impure it comes as a brown powder and usually contains caffeine. Heroin is normally wrapped in small packets of paper. Heroin is usually injected, sniffed/snorted, or smoked. Typically, a heroin user may inject (called "mainlining" or "shooting") up to four times a day. Intravenous injection provides the greatest intensity and most rapid onset of euphoria (7 to 8 seconds), while intramuscular injection produces a relatively slow onset of euphoria (5 to 8 minutes). 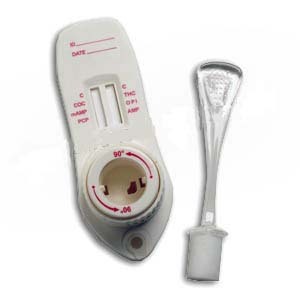 Signs of heroin addiction include paraphernalia for injecting heroin. This consists of hypodermic needles, small cotton balls used to strain the drug, and water and spoons or bottle caps used for "cooking" or liquefying the heroin. When heroin is sniffed or smoked, peak effects are usually felt within 10 to 15 minutes and usually last from four to six hours. Although smoking and sniffing heroin do not produce a "rush" as quickly or as intensely as intravenous injection, NIDA researchers have confirmed that all three forms of heroin administration are addictive. Paraphernalia for inhaling or smoking heroin includes razor blades, straws, rolled dollar bills, and pipes. Individuals addicted to heroin may use many different slag terms for the drug. Droopy appearance, as if extremities are "heavy"
Please take note: many of these signs of heroin addiction are common to adolescent behavior, indicating irresponsibility or psychological problems like depression and do not necessarily mean someone is using heroin. If one or more signs were noted, it would be wise to follow-up and identify the source (s) of the problem.